Born on March 19th, 1963, in Saint Joseph, Manitoba, Bishop Marcel Damphousse was ordained a priest on June 28th, 1991 for the Archdiocese of Saint Boniface. He served in a number of French and English parishes throughout the Archdiocese before being named Rector of the Cathedral in 2008. 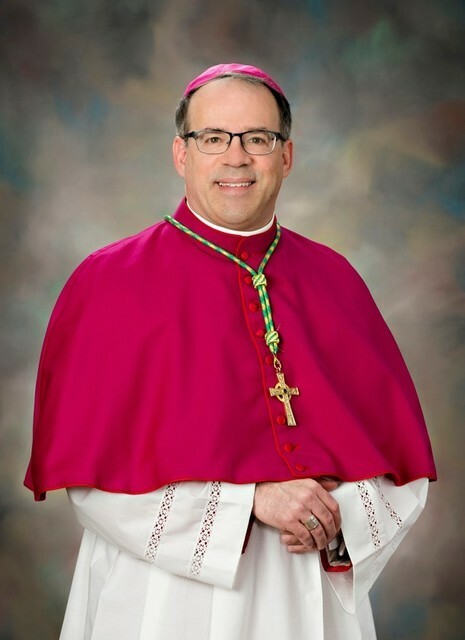 The Bishop earned a Bachelor’s degree in psychology in 1984 at the University College of Saint-Boniface, followed by a Bachelor’s degree in theology in 1989 from Saint Paul University, Ottawa. He received his formation for the priesthood at Saint Paul’s Seminary, Ottawa. In 2002 he earned a licentiate in spiritual theology from the Teresianum in Rome. For a number of years, Bishop Damphousse taught at the Manitoba Catholic School of Evangelization, and was vocations director for more than 12 years. Before being appointed Rector of the Cathedral, he was chaplain at St. Boniface Diocesan High School for five years. He gained experience as a member of the Diocesan Finance Committee, the Presbyteral Council and of the Diocesan Commissions for Liturgy and for Catechesis. He also served as the spiritual director of the TEC (To Encounter Christ) movement for eight years. On June 28th, 2012, His Holiness Pope Benedict XVI named the Reverend Marcel Damphousse as Bishop of Alexandria-Cornwall. He was ordained bishop on September 2, 2012 in St. Finnan’s Cathedral in Alexandria, ON. On November 12th, 2015, His Holiness Pope Francis appointed Bishop Damphousse as the sixth Bishop of the Diocese of Sault Ste. Marie, Ontario, Canada.